Close your eyes and picture a disabled person. At work, one of my jobs is finding images to pair with our weekly newsletter articles. Since we are a non-profit that advocates for people with disabilities, I often find myself combing through stock photo websites looking for pictures of disabled people. I am met with hundreds of pictures of white, male, cisgender-appearing, manual wheelchair users. Is this who you saw when you pictured a disabled person? Certainly, these pictures reflect my whiteness, though in all other regards I would never be mistaken for any of these men. Yet for much of my life I pictured this default straight, white, male wheelchair user whenever discussions of disability came up. Not myself, nor my queer family, nor people of color, nor women. Often, the disability spaces I have been in have reflected as much, centering the same “typical” disabled people who populate conventional wisdom and stock photo searches. Intended or not, the message that those of us outside of that type matter less is apparent. We don’t entirely belong, therefore our needs are less important. It has taken practice for me to unlearn the narrow image of who we are. Years of practice to imagine myself – so many of us – at the center of a group that we have always belonged to. 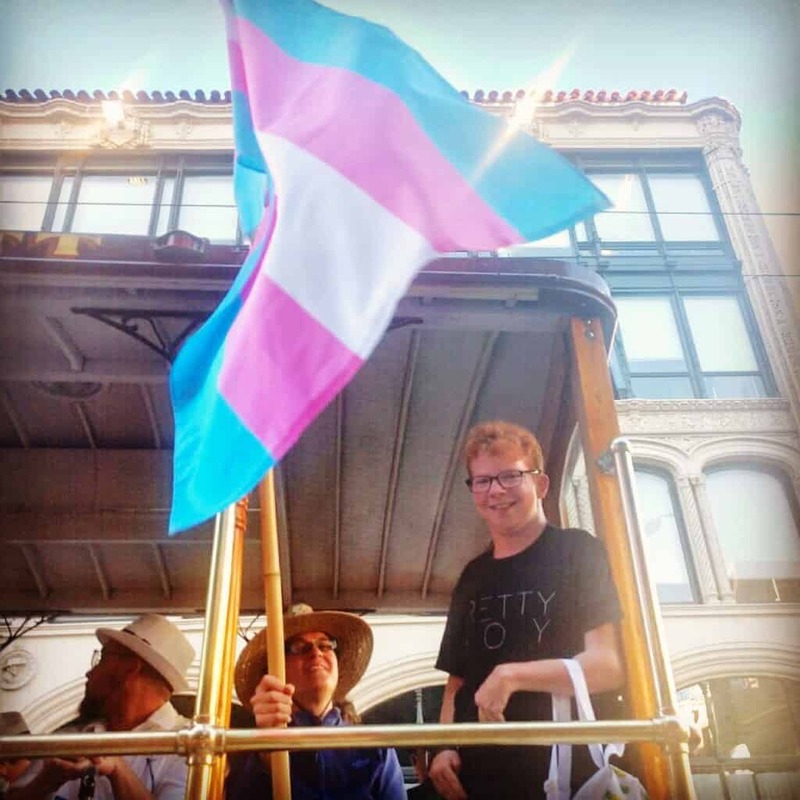 Last month I went to the annual Trans March that marks the start of Pride weekend in San Francisco. I hadn’t known about it until a friend told me less than a week before it occurred. Less than a week to figure out how to participate in a two-mile-long march in a city I don’t know well had the potential for catastrophe. Or, at least, it had the potential for me to get all enthusiastic in the moment and push myself into the kind of pain and exhaustion that leaves me in bed for a few days or weeks, capable of little beyond taking handfuls of Advil, groaning intermittently, and napping. But I so wanted to go. I came out as trans four and a half years ago, and due to the somewhat absurd circumstances of my life this was the first Pride Month that I have been in the country for. I wasn’t about to miss marching and celebrating with my trans siblings. But queer spaces have the same default white guy problem that disabled spaces do. The only differences are that where the disabled default white guy is disabled and straight, the queer default white guy is queer and able bodied. I assume that queer spaces will be inaccessible to my disabled body the same way that I assume disabled spaces will find my queer body distracting. The Trans March was a revelation. Thousands of trans people of every description marching and celebrating themselves and each other. Amid the celebration we called out as one for equality, starting from the most marginalized and working forward from there. I took this all in from the front of the march in my seat on the accessibility trolley that the organizers arranged for those of us without wheeled mobility devices who would have struggled with the walk. Truly, it was the queer, multigender, multiracial, all-ability utopia we all deserve. Yes, I was primed to enjoy the day no matter what, and yes, I can be disgustingly cheerful at times, but everyone I saw, everyone I talked to, seemed to radiate a similar experience of the moment. This left me with two questions. How had the organizers gotten it so right? And how can the disability community learn from this and improve? The trolley itself is the first answer. I have no idea how one goes about renting a trolley. It must have involved planning. This shows that the picture of who would attend the Trans March had always included disabled people, just as it had included every other type of trans person. The effect of this was personally empowering, but more importantly, it meant that more people felt welcome and therefore more people showed up. Inclusion as an add on is a start, but can often fall short of its goal. Feeling tacked on is better than feeling invisible, but neither compare to the feeling of belonging. Narrow definitions of who we are and which sort of people make up the “us” for which we plan events weakens our work by alienating many of the people we hope to reach. We must make diversity our default from the beginning if we want to harness our power for creating an inclusive world. Expanding our definition of who we are is a lifelong practice. Even so it can begin simply. We must listen deeply to people who have led lives different from our own. Read the articles and books they are writing, watch the movies and TV shows they are producing, and follow them on social media. When we begin planning anything we must look to the people living at the intersections of disability culture, hire them to help us plan, and value their opinions. Through these small, consistent efforts we can expand our world until it is large enough for us all. Christian McMahon is one of the 2018 Rooted in Writing Fellows. He is a disabled trans writer living in Sacramento, California as well as the communications specialist for The Arc of California. His work has appeared in publications including the Toast, Catapult, and BuzzFeed, among others.